Vehicles, like any machines, need regular auto service to keep them running smooth and in order to prevent serious damage. No matter how careful you are with your car, there will be moments when some parts will require repair just because of the high mileage. An average driver will take his car for an auto check in these cases . But there are drivers who know a thing or two about car maintenance, and choose to skip mechanics and fix the problem themselves. Depending on what kind of a problem we are dealing with, DIY solutions can be very bad or cost saving. Experience and knowledge are also important factor in this case. If you feel that you are skilled enough to fix anything regarding your car, re-consider some aspects. Firstly, there are few parts that people know how to fix and with some experience you will not need any help from auto service professionals. But some people, due to finance problems or just plain stubbornness still choose to try to fix anything that causes problems with their car. Eventually they end up messing other parts and paying even more for auto repair at local mechanics. Second, if you’re having problem with a new car, be aware that opening your engine cover can instantly erase your warranty and you will no longer benefit free car check and services from official manufacturers. Regardless of these downsides of acting as a professional mechanic, there are some parts of your car that can be repaired at home. This are already known to most people but are worth mentioning anyway. Spark plugs, oil change, air filter change, battery change and several other services are maintenance tasks that you can easily perform at home just by reading an article on related sites like howstuffworks or eHow. 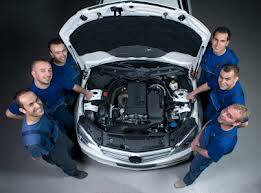 But anything related to the car engine is preferred to be left to professional mechanics. Nevertheless, it is always best to take your new or used car to certified auto service shops that can perform log book services and obtain detailed information about your car. This information will help mechanics identify what’s causing problems with your car and solve them in a fast and efficient way. Moreover, warranty will still be valid and you’ll pay lower costs for any repair.